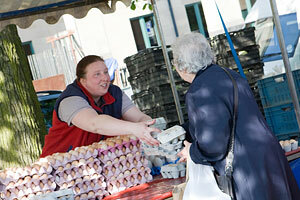 Locally produced food is of growing importance to Scottish consumers. They are looking to domestic producers and suppliers to provide them with food that is easy to trace, environmentally friendly and supports the local economy. SRUC has highlighted the need to support and develop local food and drink businesses, of which there are over 75,000 in Scotland. This has resulted in the creation of Think Local, a £2.5 million government-funded project that aims to promote Scotland’s thriving local food and drink culture. In 2007 the national food discussion initiated by the Scottish Government highlighted how high demand for local food was in Scotland. Diet and nutrition is a growing concern nationally and, close behind it, locally sourced food. Consumers now have a keener awareness of the food industry and there is growing concern over the importation of processed products – for both welfare and environmental reasons – as well a strong interest in supporting local businesses. While the current economic situation means that price is still a key factor for consumers, quality and provenance are becoming more important as selling points for local producers. The SRUC research programme analysed the trends in regional and local food and drink businesses in Scotland; there are 60,000 small to medium sized local food businesses in Scotland employing over 165,000 people. Through detailed study the team gained a better awareness of where local food businesses are located and how they market their products. Consultants and researchers in SRUC have used the knowledge gained to develop their work supporting the growth of Scotland’s local food businesses, approximately 80% of which are small and medium enterprises (SMEs). The teams have long been strong advocates for local food in Scotland and, through on-going discussions with the Scottish Government, SRUC consultants were able to develop Think Local. 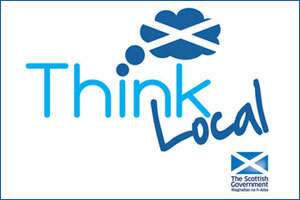 Think Local is a government-funded project. £2.5 million has been set aside to promote Scotland’s thriving local food and drink culture. SRUC will coordinate £1 million that will be spent on building support for food producers and suppliers who promote Scottish goods. There is also a further £1.5 million available through the Community Food Fund to provide funding to community groups who wish to create their own local food initiatives. Consultants and researchers in SRUC have used the knowledge gained to develop their work supporting the growth of Scotland’s local food businesses, approximately 80% of which are small and medium enterprises (SMEs). The theme of collaboration runs through the Think Local programme, recognising the ability of project partners to deliver growth and support, and ensuring activities are combined to the benefit of the food and drink SMEs. The scheme will bring together complementary strands within the sector; from farms shops and farmers markets through to the regional networks which enhance Scotland’s reputation for quality food. Think Local has set some ambitious, and achievable, targets. These include reducing food and drink poverty in five of Scotland's urban areas, delivering nine new applications for Protected Food Name status and delivering five showcase events for local and regional food. In the long term this emphasis on and support for local food will benefit all those who live in rural areas, offering them diverse job options, financial security and vibrant sustainable communities where they can thrive. The Scottish Government, Scotland Food & Drink and SAC Consulting. Call 01224 711088 or email food@sac.co.uk.